Aston Martin and Total have signed a global partnership agreement that sees the latter becoming the official energy partner to the UK-based luxury carmaker. For two years, Total will be providing its products to Aston Martin and its official motorsports outfit, Aston Martin Racing. As part of the agreement, Total will supply Aston Martin throughout the FIA World Endurance Championship (WEC) becoming the “Official Lubricant and Technical Partner” of Aston Martin Racing. With 45 years of expertise in all areas of motorsport, Total has developed lubricants, greases, fluids, and special additives of high quality and technical performance. 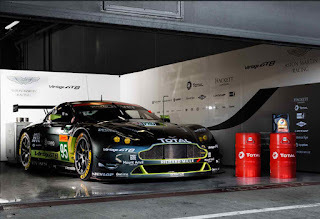 All three Aston Martin V8 Vantage GTE entered by Aston Martin Racing will race with Total lubricants. This marks the first time outside Formula One where Total will provide a mobile laboratory and technical support with a dedicated engineer present at each WEC race event. Total and Aston Martin will also explore other options for further opportunities to use the former’s Total Excellium products.